Nokia say "Life is at your fingertips". Nokia E62 is design for internet and business so;ution. You can easily acces to internet and check your email, also have great voice quality and Long battery life. This slim, quad-band GSM/GPRS/EDGE smartphone runs on the Symbian operating system and can handle nearly any type of push e-mail. 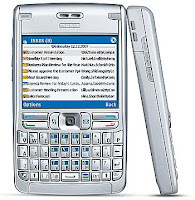 With a big, hi-resolution color screen (320 x 240 pixels) and a full QWERTY keyboard, the focus is on email with a dedicated button and flashing message light. - The name of the calling party (spoken caller line identification) is mixed with the ringing tone. The functionality is enabled/disabled through profile settings.